This satellite image shows Barangay Olympia in Makati City. MANILA, Philippines — The aide of former Makati Mayor Jejomar “Junjun” Binay Jr. passed away on Friday night a day after unidentified motorcycle-riding assailants shot her. The STAR on Saturday reported that Monaliza “Monette” Bernardo has passed away. She was the executive assistant of the former Makati mayor. 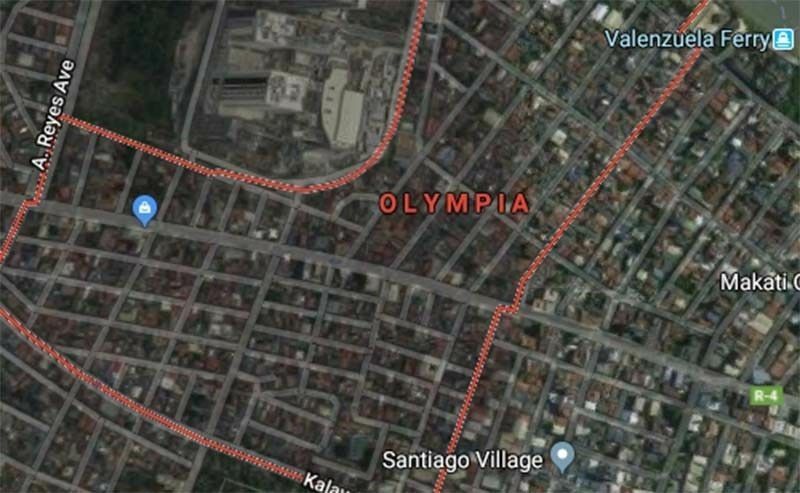 Bernardo was shot in front of her house in Barangay Olympia, Makati City just as she was alighting from her vehicle on Thursday night. She sustained wounds in her right hand and abdomen. She was rushed to the hospital but died a day later. The STAR reported that witnesses pointed to a gunman, at least 5’8” in height, wearing a yellow shirt and black helmet. The driver of the motorcycle was believed to be a man of medium build, wearing a blue shirt, denim pants and black helmet. The same report quoted Binay, describing Bernardo as a kind person who did not make any enemies. The former Makati mayor said he believes that the attack against his executive assistant was “politically motivated,” noting that it happened after the Court of Appeals upheld its ruling that cleared him of administrative charges over alleged anomalies in the construction of Makati City hall park building. The attack against Bernardo also came days after one of his supporters was also shot dead, said Binay. He called on the Commission on Elections to consider declaring Makati City as an election hotspot. Makati Mayor Abby Binay, meanwhile, ordered the city police to exhaust all efforts to resolve the incident and identify the perpetrators. Former Vice President Jejomar Binay said that he is ready to give a reward of P1 million to whoever will identify the perpetrators of the crime. A man went on a shooting rampage in San Juan City, killing his brother and another person on Tuesday night.